The firm was founded by Harris Holland in the year 1835. A very accomplished shot, his friends convinced him to start his own gun making business. At first the guns bore the inscription H.Holland, without an address, and it is probable that these were built in the trade to his design. A major date in the history of the company is the year 1883, when Holland & Holland entered the trials organished by the magazine 'The Field', and won all the rifle categories with flying colours. This set a new standard of excellence for the competition among London gun makers. In 1885 the rights to the trade name ROYAL were granted, and in 1908 the well known detachable lock feature with the small lever was patented and the last major development in the sidelock side by side occurred in 1922 when the assisted opening mechanism was patented. This gun, the famous self-opening ROYAL side by side, has been influential in gun-making throughout the world. 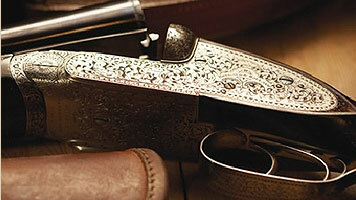 People in the know, know Purdey make some of the very best, most ornate shotguns in the business. And you could spend hours admiring the unique craftmanship that goes into each and every one of these hand engraved, most exquisite of weapons. With the invention of the Purdey bolting systems in 1863/5 and the acquisition of the rights to the Beesley self-opening gun action some 15 years later, the design of the Purdey double shotguns was set. Apart from some minor cosmetic changes, the design has remained true to the present day. Due to the high standards of craftmanship set over the last century and a continuing flow of highly trained craftsmen taught in the most traditional of manners, Purdey has remained at the very forefront of the London and world gun trade. Boss & Co as we know it today was founded in 1860, although production was taking place under the Boss name prior to this. It was in 1894 that Boss became more than just a very good gunmaker when they patented the single finger trigger mechanism, regarded by many as the very finest ever made, this put them on the world map. It has also been agreed amongst experts that the 1909 o/u gun was one of the best.